The day started out with everyone picking their own table, but as the room started filling up, all the chairs are full. We went through the typical orientation type stuff, and then a team building exercise with a marshmallow. 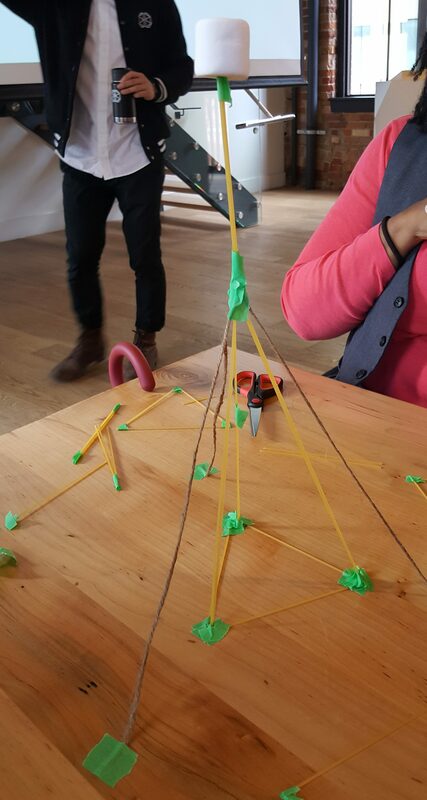 Our team did pretty well, and though it wasn’t the tallest one, we certainly got in the running and it never wavered. Hopefully, this is a sign of things to come! We then broke off into our respective programs and had to have our head shots taken, and now, I know that they use those to show on the demo day website. I even saw one of my old students listed on their graduates! We had a catered lunch, and I oddly enough, sat more or less on my own. When we came back from lunch, they ran us through more specific orientation for our program, did introductions and showed us some previous projects. Interestingly, I am one of about two people in the entire class (about 30) that has an education in coding of any kind, and he’s a web developer already. There are only 5 women in the Web Development stream, which is lower than what I anticipated, given the number of women that I saw this morning. Don’t get me wrong, there were quite a few engineers, and financial people, so the level of education was high in many cases, but not specifically in technology. Who knew that I might be one of the more technologically advanced people in this class? So now, I’m sitting in the beginnings of my first lecture, and the instructor is really engaging, but in my case, I teach the history of the internet, what HTML and CSS are and how they are used, so it is a little basic for me. I promise to try and keep my head down, instead of taking over. By tomorrow, I’ll engage this process whole-heartedly. Today, I’m running on pure adrenaline, especially when I woke up at 6 am and couldn’t go back to sleep. I’m going to use this time to catch up on my blogging, as well as complete the prep course, that I’m about 90% done. It’s only about 3 pm and we still have an event at 6 pm, but we get to work on a lab and then the instructor leads us through his solution. Given this, I think we’ll do just fine. After the class was done, we headed over to Wurst, where we were treated to a beverage and some snacks, which was just a nice way to kick off the course. We got to sit with both cohorts, not just the web development. Met with one of the instructors who wants to get some blogging going among the students. So, I showed her my post from yesterday. Apparently, I’m in! Making good progress and need to keep it up. Still learned stuff today, so it wasn’t all stuff I knew already. Tomorrow, I’ll really start digging into stuff that I know on the surface, but not yet in depth. Let the games begin. Thanks to everyone that has supported me thus far, and has given me hope in completing this course. Stick around and I’ll tell you how it goes! 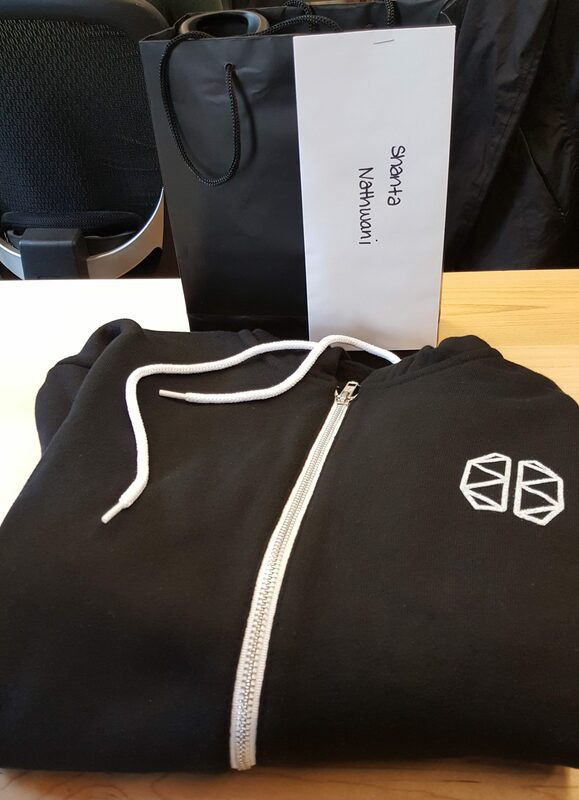 They even gave us some cool swag! I feel like I’m at a WordCamp again. Today, I start BrainStation in the full time Web Development bootcamp. For the next 10 weeks, Monday through Friday, 10 am to 6 pm, I’m coding. I won’t be teaching and probably not responding to a heck of a lot during that time, but I’ll be around. The timing for this was perfect. I have about a month off from teaching between semesters anyway and figured, why not use the time to my advantage? I’m not missing a whole semester, but only 6 weeks of teaching, representing May and June. I plan on returning to Sheridan College for the July/August portion of the semester, but who knows how long that will last? I know a lot of stuff, but only in bits and pieces. I’ve learned that I have trouble learning on my own time, at my own pace, so dedicating the time to this, without other obligations is the only way I’m going to get this done. Why BrainStation? Firstly, they start us off nice and easy with HTML and CSS. This gives me a chance to get back into the swing of things and get accustomed to being a student again, rather than a teacher. Let someone else be responsible for being in front of the room and doing the slides. I’ll just sit and learn. Second, the schedule fit perfectly with the timing of what was going to work for me. Lastly, but certainly not least, I got an automatic $1,000 scholarship for being a woman in technology from BrainStation. It didn’t hurt that they are one of the educational partners for DevTO and that it turns out that I know one of the admissions officers. So here’s me, off on my first day as a student…again. Will try to write as frequently as I can, but know that I’m going to be focussing on other things. That being said, looking forward to seeing what opportunities the future holds. I may even be looking for my next opportunity when this is all over. Hope you will join me on this journey! And hey, I even started using Instagram. Find me @ShantaDotCa.